the life of a wife: Running Out? Run In. Through October 25, look for the Running Out? Run In. event in Publix stores to take advantage of great savings on some of your favorite products from General Mills and Proctor & Gamble brands. 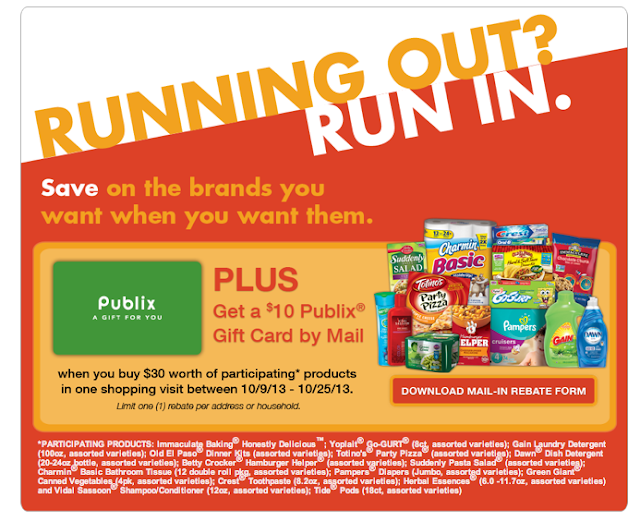 Plus you can get a $10 Publix gift card for spending $30 on participating items. Publix always has great savings (and doubles coupons up to $0.50 every day! ), but with this event you can save even more.